The trials and tribulations posed by life on the overland trails were a subject close to Jackson's heart. He himself had endured these same hardships by crossing the Plains in 1866, and his paintings often focus on the many dangerous incidents that could arise during the 2,000-mile journey. The first monumental challenge emigrants encountered involved crossing the Missouri River. 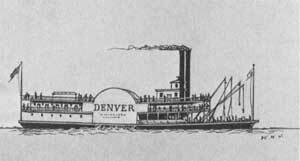 The river's width, depth and swift current made it unwise to try and float wagons across on individual rafts, and unless crossed in the dead of winter when the river was frozen solid, it was safer to transport the wagons and teams across the river on the small steam ferries operated by opportunistic businessmen. Long delays while waiting a turn on the ferry were common, and it is this bottleneck that Jackson depicts in his work, Emigrants at Kanesville. A handwritten note by Jackson in the upper left corner of the painting describes this as an 1856 river crossing, which would have been near the peak of Mormon emigration. 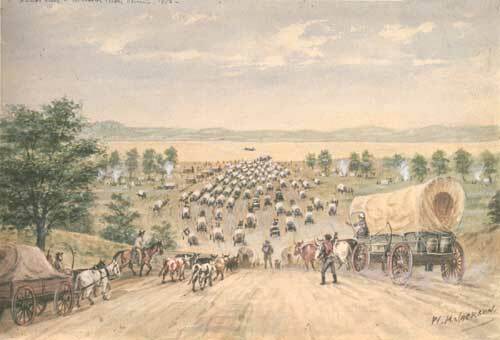 In the spring of 1847, the first group of Mormons ventured out onto the Plains and arrived in the Valley of the Great Salt Lake in July of that same year. In the years that followed, the increased numbers of emigrants and gold-seekers resulted in Omaha, Council Bluffs, Brownville, and Nebraska City developing as major river crossing sites and towns. The overland trails and the relatively slow pace of the wagon trains were deceptively peaceful. Although normally a placid river, when swollen by melting snow or heavy rains, the Platte River developed dangerous currents. Unstable riverbanks, quicksand and hidden tree stumps or logs took a heavy toll in drowned teamsters and damaged wagons when unwary emigrants tried to ford the Platte or even the smallest streams. As such, crossings were only attempted when it was absolutely necessary. Life on the trails was primarily an endurance test. Long hot days of monotonous travel, interspersed with violent storms, lack of fuel and forage, fear of Indian attacks, dust and diseaseall took a tremendous physical and psychological toll on the emigrants. No records were kept on how many people gave up and turned back, although in some years the numbers must have been rather high. The wonder is that the majority of the emigrants continued their westward journey. Jackson's admiration for the courage of those brave souls who continued their trek in spite of the many hardships on the trail is seen is many of his paintings. Rather than depicting patriotic vignettes, Jackson concentrated on the quiet stoicism of people in pursuit of a better life. 1. Stanley B. Kimball, Historic Resource Study; The Mormon Pioneer National Historic Trail (Washington, D.C.: National Park Service, 1991), 66.